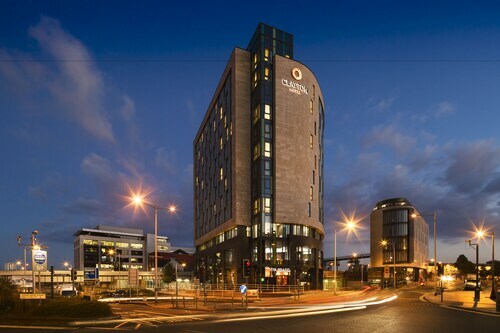 Located in Cardiff City Centre, this eco-friendly hotel is within a 10-minute walk of Cardiff Motorpoint Arena, Cardiff Bay, and Principality Stadium. Cardiff Castle and St. David's Hall are also within 10 minutes. Cardiff Central Station is 6 minutes by foot and Cardiff Queen Street Station is 8 minutes. 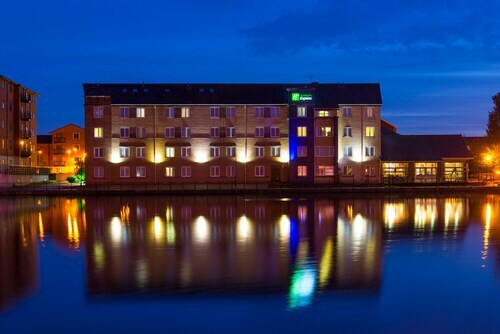 Located in Butetown, this hotel is steps away from Doctor Who Exhibition and Cardiff Bay. Cardiff Motorpoint Arena and Wales Millennium Centre are also within 1 mile (2 km). Cardiff Bay Station is 7 minutes by foot and Cardiff Central Station is 27 minutes. 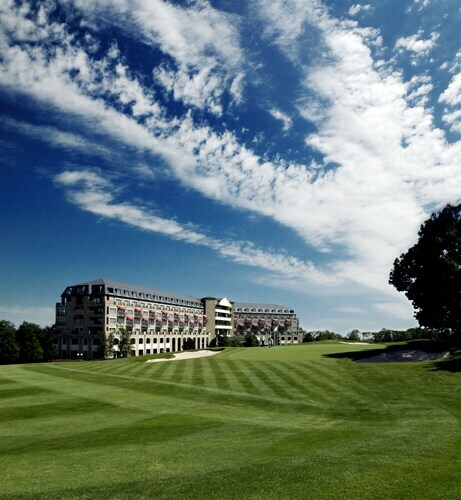 This eco-friendly hotel is located in Cardiff (Cardiff City Centre), near the airport, Principality Stadium, Cardiff Castle and National Museum Cardiff. Also nearby are Cardiff University and Wales Millennium Centre. 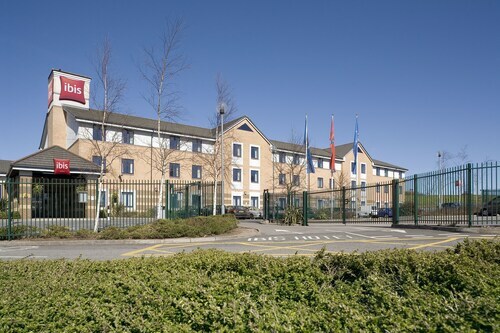 Located in Cardiff City Centre, this hotel is within a 10-minute walk of Cardiff Bay and Cardiff Motorpoint Arena. St. David's Hall and New Theatre are also within 15 minutes. Cardiff Queen Street Station is 11 minutes by foot and Cardiff Central Station is 13 minutes. 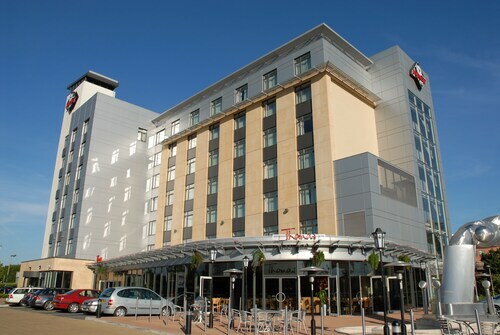 Located in Cardiff City Centre, this hotel is within a 10-minute walk of Cardiff Bay and Cardiff Motorpoint Arena. St. David's Hall and New Theatre are also within 15 minutes. Cardiff Queen Street Station is 10 minutes by foot and Cardiff Central Station is 11 minutes. 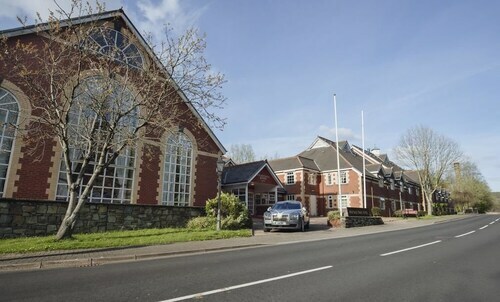 Located in the heart of Newport, this hotel is within 3 miles (5 km) of Friars Walk Newport, Newport Cathedral and Belle Vue Park. Newport Transporter Bridge is 2.9 mi (4.7 km) away. 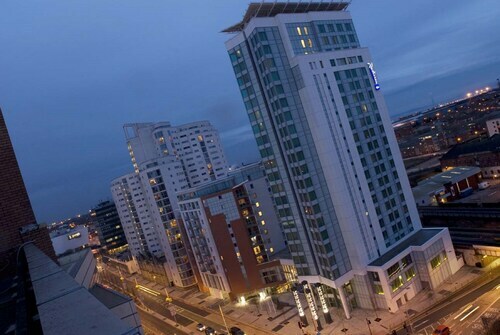 Located in Cardiff City Centre, this hotel is steps away from Cardiff Motorpoint Arena and Cardiff Metropolitan Cathedral of St David. 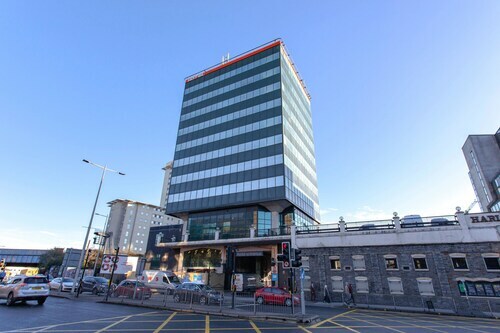 Capitol Shopping Centre and St. David's Hall are also within 10 minutes. Cardiff Queen Street Station is 6 minutes by foot and Cardiff Central Station is 8 minutes. Located in Rhoose, this hotel is 2.2 mi (3.6 km) from Brynhill Golf Club and 3 mi (4.9 km) from Barry Island Pleasure Park. Barry Island Beach and Cottrell Park Golf Resort are also within 9 miles (15 km). This family-friendly Newport hotel is located in a regional park, within 2 mi (3 km) of Caerleon Amphitheatre and Isca Augusta. Newport Wetlands and Friars Walk Newport are also within 6 miles (10 km). 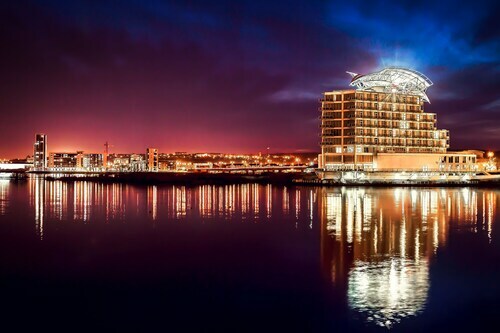 Located in Butetown, this luxury hotel is within a 15-minute walk of Cardiff Bay and Wales Millennium Centre. Cardiff Motorpoint Arena and Principality Stadium are also within 2 miles (3 km). Cardiff Bay Station is 12 minutes by foot and Grangetown Station is 27 minutes. 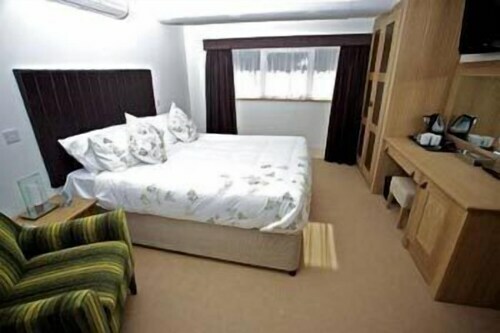 Located in Pontcanna, this luxury guesthouse is within a 10-minute walk of Swalec Stadium and Sophia Gardens. Principality Stadium and Cardiff Castle are also within 1 mile (2 km). Ninian Park Station is 17 minutes by foot and Cardiff Central Station is 21 minutes. Situated in Newport, this luxury guesthouse is within 6 miles (10 km) of Isca Augusta, Caerleon Amphitheatre and University of Wales-Newport. Dewstow Gardens & Hidden Grottoes and Newport Stadium are also within 6 miles (10 km). So, you're considering a holiday to Cardiff? If you'd like to find accommodation that's located close to the sights, you can enter your holiday dates and then use the filters beside your hotel search results to find somewhere to stay near the area's attractions such as Principality Stadium, Cardiff Castle and National Museum Wales. 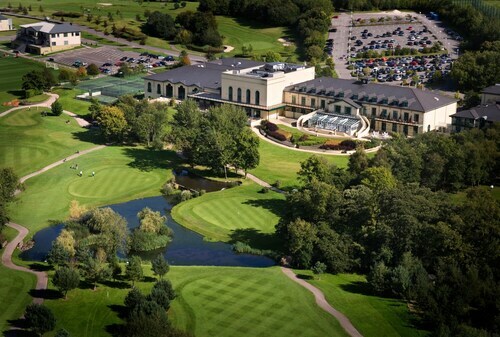 You can choose among 281 Cardiff hotels and accommodation choices to find a place to stay. 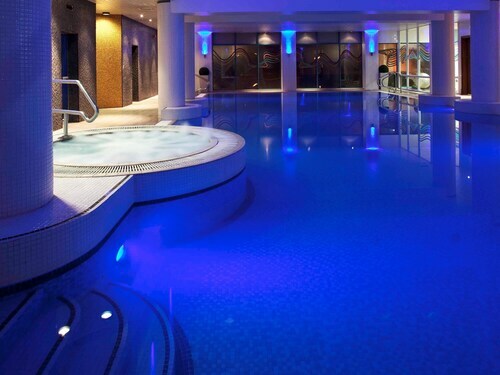 When you're thinking about where you'd like to stay in Cardiff, you can easily and quickly search ebookers for hotels offering services such as high-speed Internet, a swimming pool or free airport transport. You can take advantage of the filters to narrow down your search for a hotel, so you get the services that are important to you, such as an in-room kitchen or air conditioning. When arranging your Cardiff getaway, you can also use ebookers to look for a convenient flight to Cardiff (CWL-Cardiff Intl.) Airport. You can narrow down your search by number of stops, airline or departure time to find the one that'll work best for you. When is the Best Time to Explore Cardiff? If you're curious when is the best time of year to visit Cardiff, you might find this info about seasonal weather useful when you are planning your trip. The warmest months in Cardiff are typically August and July, whereas the coldest months are usually February and January. The months with the most rain are March and August, whereas July and June have the least. From January to March, the average daytime temperature is 10°C and at night it is 2°C. Seasonal average rainfall is 9 mm. If you visit between April and June, you can expect an average temp of 19°C during the day and 4°C at night. Average rainfall during this season is 6 mm. The daytime average temp from July to September is 20°C and the nighttime average is 10°C. Average precipitation for this season is 8 mm. The average annual rainfall in Cardiff is 32 mm. Thank you for good value for money: tidy room and friendly staff! There was a shower in the tiny room, which was pleasant and double bed was fine.The only downside was that there wasn’t any light or sink in the toilet, which was separate from the shower. Really friendly welcome and well maintained hotel. Secluded hotel with great views and facilities. Lovely helpful staff. Good breakfast and a lovely relaxing environment. Voco is a really great hotel... it’s recent refresh has brought the place up to date. 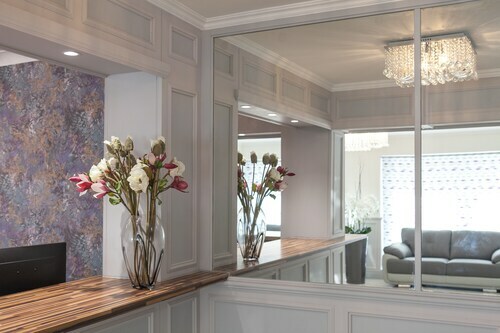 The place now looks great - the rooms are spacious, beautifully appointed and have the most comfortable beds.... and the city and Bay views are beautiful. Staff were amazing, really welcoming, courteous and helpful. Perfect stay. I was very impressed with the staff. They were so pleasant and yet very professional. They were very helpful. Good: Central location is good, close to shops and sights. Not so good: I went out one day and upon return, I noticed the maid forgot to make my bed. The issue was resolved though.